August 21, 1993 - Ever since I arrived in this country more than 31 years ago, the media have been putting labels on me. First I was a refugee. Then I was an alien, an immigrant, a naturalized U.S. citizen, and then a minority. Later, I was a Hispanic, and now I'm a Latino. But to many misled North Americans, these terms have a racial connotation — especially for immigrants from Latin America. Hispanics/Latinos Come in all Colors! fail to recognize that although Latinos have a common geographical, cultural, and linguistic identity, they are not a race. Latinos are the most colorful rainbow. They are mostly descendants of Spaniards, Africans, and Indians, but they represent all the races. Some uninformed people refuse to see our ethnic and racial diversity. But despite the myths and misconceptions, many Latinos are white, of European origin — while others are black, Asian, Indian, or a combination of races. Unlike in the United States, where people are either officially black, white, or Asian, there are many more racial categories in Latin America. People can be mulatto because their ancestors had white and African blood, or they can be mestizo because they have Indian blood. Many times, people are a mixture of all three. Usually, people refer to themselves in terms of their national origin. And then even some Latinos add to the confusion. 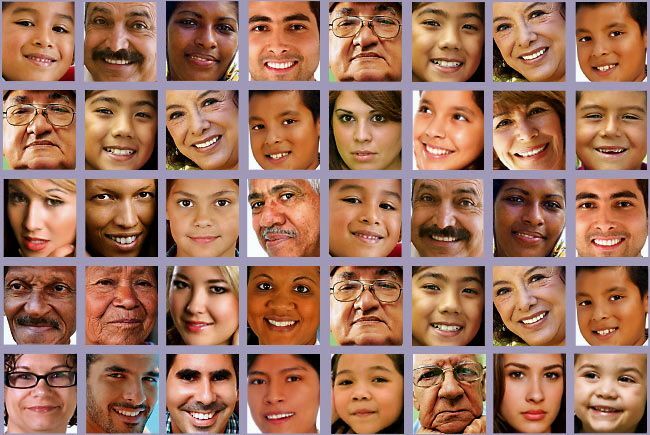 Many look white or Indian and refuse to acknowledge their multiracial background. Although it's estimated that at least one-third of the nation's 22 million Latinos have African ancestry, some tend to deny it. They look black, but they tell you they're not. They're Latinos. This causes justifiable resentment from black Americans. But even they can take this to the extreme. They can be offended if some deny their African roots, but they can't expect others who are not black to deny their European ancestry. The large majority of Latinos are proud of their Spanish, African, and Indian ancestry, but many others are just as proud of their Asian and Jewish heritage. People can be Cuban with Jewish, Lebanese, or Chinese ancestors; Venezuelan of Polish stock; Mexican of Aztec, Japanese, or Irish ancestry; Peruvian of Inca, English, or Russian lineage. Or people can be Argentine of Italian, German, or French descent. The list goes on. And so, just like North Americans, when something happens anywhere in the world, there are Latinos who feel it under their skin. For non-Latinos, this racial diversity is one of the most confusing things about Latinos. They have been mislead by the government, the media, corporate America, and Madison Avenue, which find it convenient to lump all Latinos together into one category, "Hispanic," with a racial connotation. But for Latinos, including many who refuse to use the term "Hispanic" because they feel it was imposed on them by government bureaucrats, this is one of the most irritating things about dealing with Norte Americanos. They find it especially irritating when confronted with applications or other forms which ask them to make a choice between white, black, or Hispanic. They never ask us if we are white, black or Irish. But with Latinos, they want to make a race out of our geographic and cultural identity. Not everyone, of course. Some born and raised North Americans of European ancestry are beginning to see the light. Like my Italian-American friend, Giordano, who called me up to confess that now she can identify with Latinos a lot better. She said that now she understood how Latinos feel when they are categorized as a single race. She said that she was shocked by what she heard from an acquaintance who was trying to be friendly. "I grew up in a neighborhood with all Italian people," Giordano was told, "I was the only white person in that neighborhood." But this happens to all of us. At a restaurant, I was surprised when I heard a Chinese waiter complaining about them not having enough of "my people" on the New York baseball teams. "I like baseball," he told me, "but I like to watch my people play. The New York teams don't have enough Latino players." Suddenly, I realized that this man, who appeared to be from Asia, was also a Latino. "I'm Chinese and I am Cuban," he said, grudgingly leaving the subject of baseball, "but sometimes people don't understand." ALSO READ: HISPANIC OR LATINOS?